Instant Sobriety: Just Add Cancer! This post took me waaaaaay longer than I anticipated and probably seems a little disjointed because the four days between talking to my mom and getting on the plane are still difficult to discuss. Let’s just say that I took my mom’s advice and googled inflammatory breast cancer. SPOILER ALERT: it’s the only kind of breast cancer whose staging starts at stage IIIB. I did not take this news well. 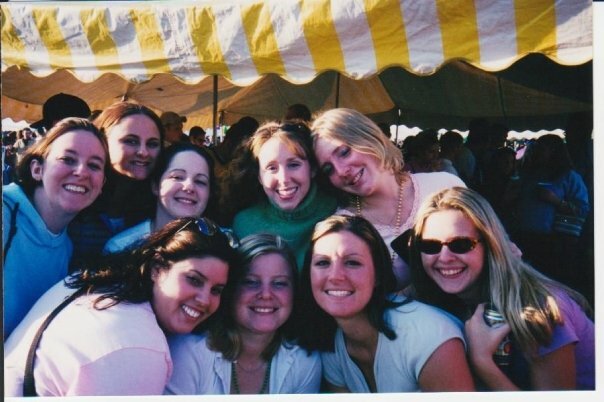 Tailgating 2002: None of us survived this night. Today is Homecoming at my alma mater. B and I had both completely forgotten about it until approximately 6:30 a.m. PDT, which is when the drunken text messages started from our respective fraternity brothers/sorority sisters, who are apparently determined to teach those undergrads a thing or two about tailgating. Kids gotta respect their elders <stamps cane on ground for emphasis>. They also have to get off my lawn. At this point, I have been awake for almost 100 hours and am being kept alive by a combination of Red Bull and fear. Somehow, I manage to check my bags, go through security and make it my gate. As the boarding process starts, my phone rings. It’s my old roommate, K, and she’s got me on speaker. She and several of my favorite people in the whole world decided that I needed a good old-fashioned drunk dial, just because. I check the clock, and it’s just past noon in Michigan. God bless ‘em. It’s at this point that I realize that there’s no possible way for this call to end well. The fact that I did not shriek or clap or hop cuts through my friends’ buzz and they KNOW something is up. I try desperately to cut the call short because this is NOT the time or place (for any of us) to tell them about my mom. She’s close with all of them and they love her to pieces. My brain feels heavy inside my skull, and the damn spinning wait cursor is still there. NOW BOARDING ZONE TWO PASSENGERS FOR DETROIT. ZONE TWO PASSENGERS, WELCOME ABOARD.